Hubby and I had an English Breakfast Blend tea the other day and found it to be less than memorable. That is, there was no distinctive character to it. Unlike English Breakfast Blend No. 1 and English Breakfast Blend No. 2, both of which have a very distinct flavor profile, this blend was bland. They had overly balanced the flavors of the different teas used. None of them stood out. The blend was supposed to be Assam, Ceylon, and a bit of Darjeeling added (yes, there is often a dash of Darjeeling in tea blends in part to add that wonderful Muscatel character and in part so they can appeal to those who have heard of Darjeeling tea and how good it is but haven’t tried it straight). The flavor came out more like something that was just hot and went well with milk. And yes a bit of sweetener was very much needed. There was no Assam maltiness, no Ceylon curranty/raisiny aroma and flavor, and definitely no Darjeeling fruity Muscatel notes. Just heavy taste and hot. Oh yeah, and wet! Tea blending is an art and should be done by those who have apprenticed with a tea master. It also takes a keen sense of taste and smell, even keener than mine. The process of tea blending is a delicate one that takes an experienced and creative mind plus many years of dedication. The results will be worth that time and effort, with a perfectly blended tea producing an unrivaled flavor enjoyed with every sip. Some say the goal of tea blending is to maintain a standard and uniform taste dictated by the marketplace, but it can be to create a whole new taste, something is a whole greater than the sum of its part (to borrow an old saying). The senses of sight, smell, and taste are key in the tea blending process: sight in the look of the blend, smell in regard to the aroma of the blend, and of course the taste. No matter what anyone says, I remain firm that tea flavor is the main attraction, even to those who drink tea for some health benefit. It is also key in tea blending, where flavor characteristics are played off each other so that one tempers or enhances another or harmonizes and while you can distinguish them, none dominates or overwhelms. It is a process that has been likened to cooking, where an extra pinch of cumin or a shallot instead of a yellow onion can make a world of difference in the outcome. So what when wrong with this version of the classic English Breakfast Blend? No idea. Could have been that they started with inferior tea. 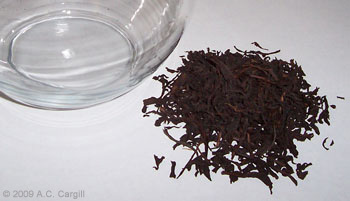 Some blenders think they can hide poor taste by using the tea in a blend. Could have been old tea or tea that had not been stored away from air and moisture. Another possibility is that none of the teas in the blend was able to stand out against the others and harmonized way too closely. All I do know is that it’s a tea I will avoid in future. When a blend cannot even stand up against such classic brands as PG Tips and Barry’s, it hasn’t a hope of pleasing a tea lover’s palate.